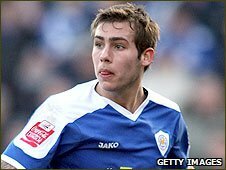 Leicester City full-back Joe Mattock has handed in a transfer request, reports BBC Radio Leicester. The 19-year-old England Under-21 international left-back has been linked with a move to local rivals Nottingham Forest and West Brom. Furious Foxes manager Nigel Pearson said: "It's a situation that has been driven by him. "In terms of confirming where he goes and for how much, I can't do that, but I'd expect it to be resolved shortly." Pearson said the manner of the request had infuriated him. "I like to deal with people straight up," he said. What is the point in leaving to go to another Championship club? "I don't like it when the player rings the chairman when we are playing a pre-season game to ask to leave when he is out of the country on international duty. "That gives you a taste of the situation and we'll wait and see what happens." Mattock also requested a move from the Walkers Stadium before the start of last season but stayed and helped the club win the League One title.